Lloyd’s Pharmacy offers all trade name and generic medications, healthcare products, as well as convenience-store items. We are a full-service pharmacy specializing in personalized service and hard-to-find products. Our customers love our great selection and friendly atmosphere, cultivated with over 90 years of experience. 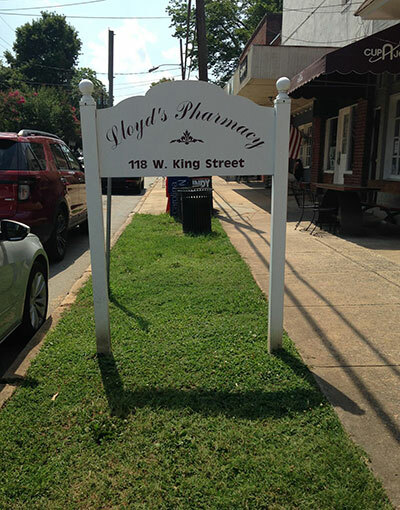 Lloyd’s Pharmacy is your trusted, local source for all your pharmaceutical needs. Family owned and operated, we have been serving the area with personalized service since 1986. Our pharmacists take the time to consult with patients about any questions, concerns or requests regarding medications or conditions. As a full-service pharmacy, we offer all trade name medications and generic medications. We also provide a full selection of healthcare products, over-the-counter medications and homeopathic remedies. If you’re in search of a hard-to-find product, it’s likely we have it! With a focus on customer-centric service and great products, it’s easy to see why we are the leading pharmacy in Orange County, NC. We are locally owned and operated, established in 1986. We are a full-service pharmacy offering brand-name and generic medications. Our staff has over 90 years of experience in delivering prescriptions in Orange County, NC. We carry a great selection of over-the-counter and homeopathic remedies. Our selection includes convenience store items and healthcare products. Visit Lloyd’s Pharmacy today, where you’ll find fast, friendly service and all the products you need for your health and convenience.